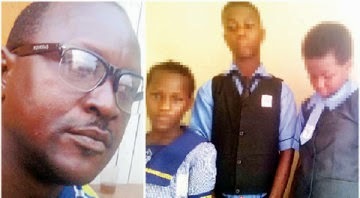 Some days back I posted a story about Children Abandoned in a Boarding school for 8years (Here). And now the father of the kids has this to say about abandoning his kids for 8years. "In 2007, my wife and I had a misunderstanding and she told me she was leaving me. I was frustrated and the children were little. Seyi, the youngest was just two years while Titilola was just five. Asked whether his wife had called him about how the children were doing, Adepegba said since she left him in 2007, he had not heard from her. Our correspondent learnt that the news of their father’s return had lifted the heart of the children. The children were all smiles when they were told that their father had promised to return before the end of the week.